The Belkin Play N600 HD Wireless Dual-Band N+ Router (F7D8301) is the ultimate router for gaming, video streaming, and other high-bandwidth tasks. Featuring Dual-Band technology for combined speeds of up to 300 Mbps + 300Mbps*, this router offers ultimate performance for the most demanding user. Included Gigabit-ports improve file transfer rates and network performance. With preconfigured wireless security settings, your network will be up and running securely in just a few minutes. And with the 3D coverage, you'll be able to access the Internet from anywhere in your home. 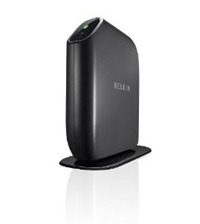 This router also comes with a suite of advanced Belkin Apps, which will improve your wireless experience. *The standard transmission rates--300Mbps, 54Mbps, and 11Mbps--are the physical data rates. Actual data throughput will be lower and may depend on the mix of wireless products used.